So something looks a little different! 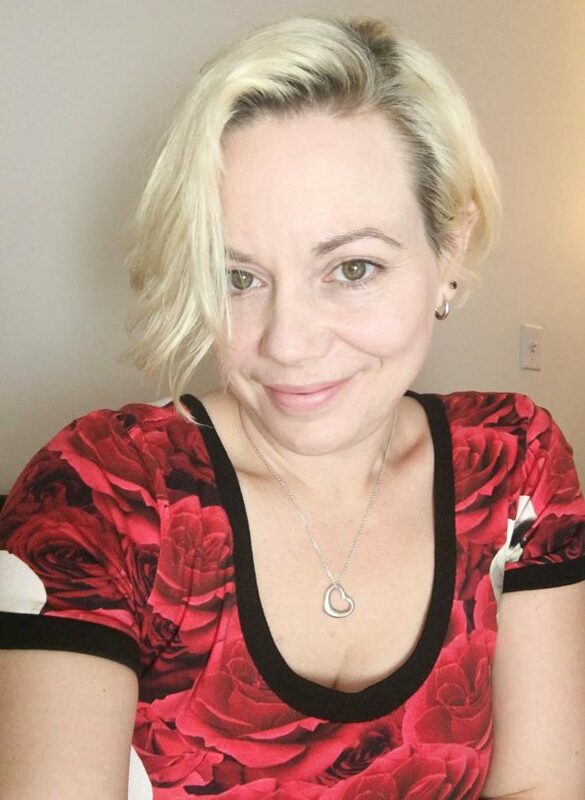 Last summer I chopped off all my hair, went platinum (yes, blondes do have more fun!) and lost over 30 pounds (more on that in another post). 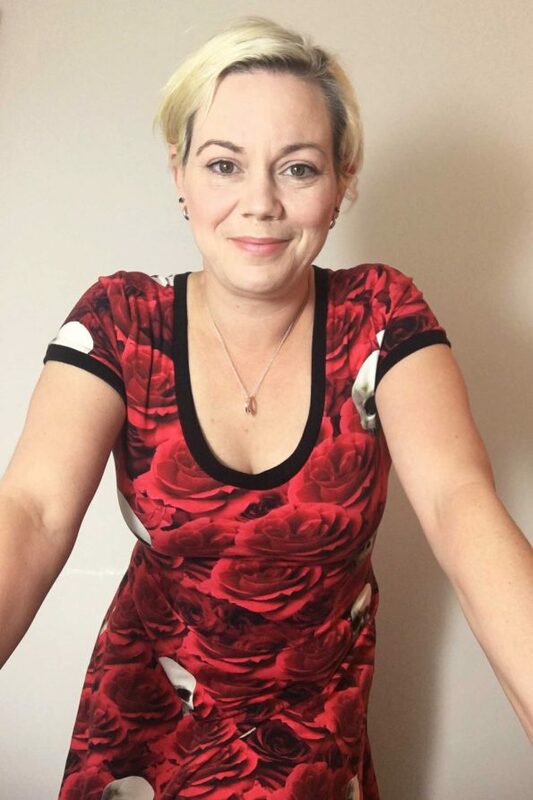 This dress was the first thing I made in my new size. It is the Lady Skater Dress by Kitschy Coo. Yes, blonds do have more fun. The thing about losing that much weight, is that nothing at all fits anymore. I went from a decent me-made wardrobe to nothing. But the thing about that is that you get to start over. I was feeling kind of stuck in a wardrobe that didn’t really fit me, both literally and figuratively. I didn’t really want to dress like a mum anymore, and I don’t have the kind of job that requires the corporate wardrobe stuffed in the back of my closet which suddenly fit again. I like the black ribbing a lot. 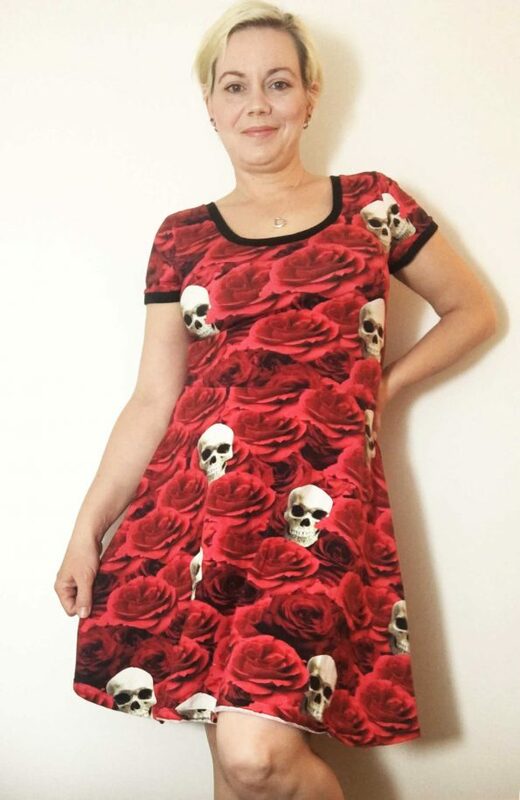 So when I made this dress I decided to choose something way more fun than I normally buy. Roses and skulls. I feel a bit more badass than normal, so I figure I’m doing it right. This pattern is perfect. It is super easy to make and the fit is great! The only problem I ran into was of course the infamous Awkward Skull Placement™. There was a 1/2 inch of skull on the bodice front that I thought would be fine but then I decided it would irritate me constantly. I had to shorten the bodice by just a sliver. If I hadn’t, the length of the bodice would be perfect, but what’s a girl to do! Pattern: Lady Skater Dress by Kitschy Coo available in sizes 1-8 (using their own pattern sizing system). I chose the short-sleeved view. There is also a long sleeve version. Fabric: Red Goth digital jersey: 92% cotton, 8% spandex, and 200 g/m2 with black tubular ribbing. From l’Oiseau Fabrics. Size: 5 (or was it the 6?). Cost: Pattern: £7.20 Fabric: About $30. Results: Great. Great fit and very comfortable. 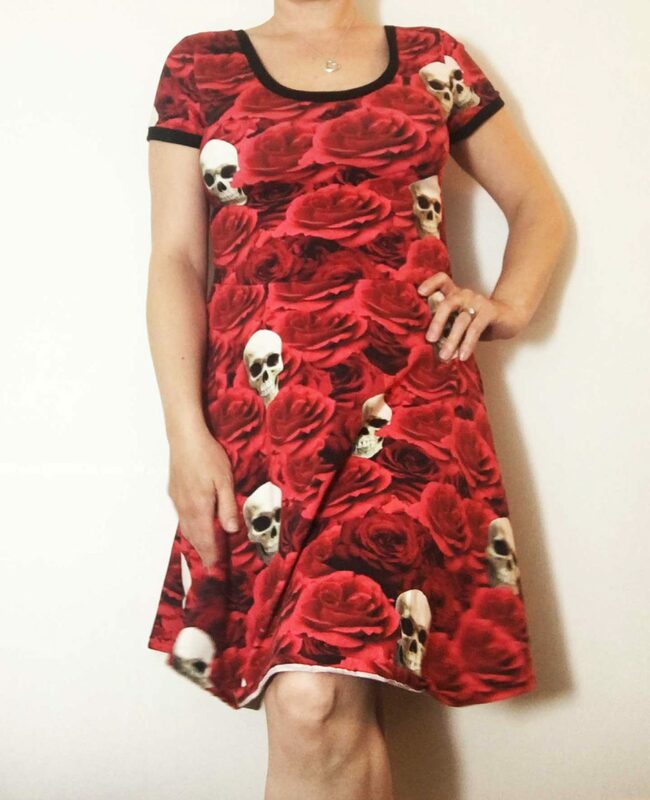 Red Goth digital print jersey. 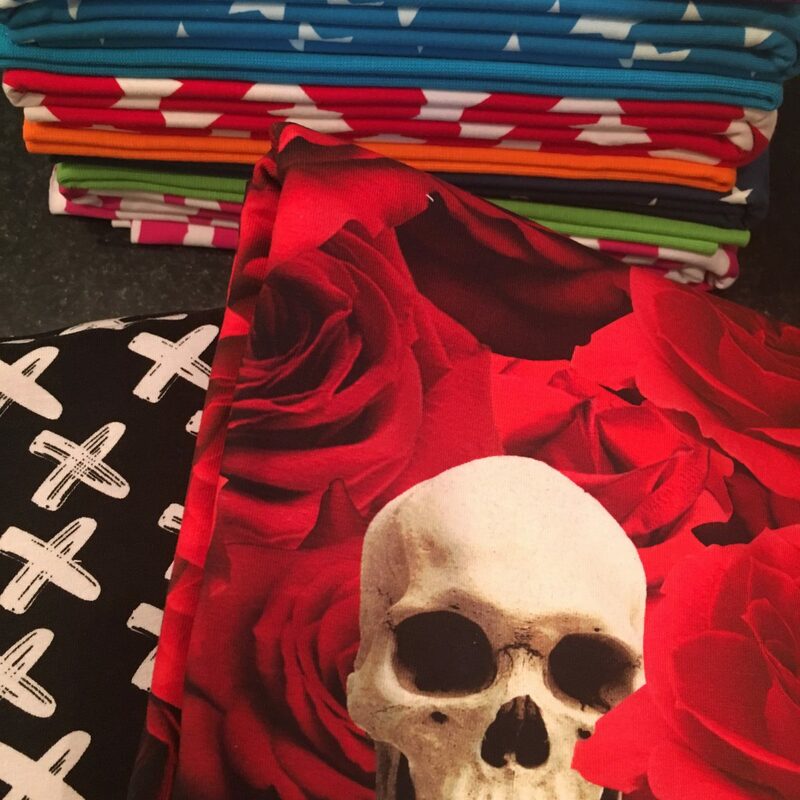 I just checked the mail and look at what has arrived: new fabric! And it is so pretty. I have been so busy and haven’t had time to sew much and have had even less time to blog about it. But I think this is just the trick to kick my sewing mojo into high gear. 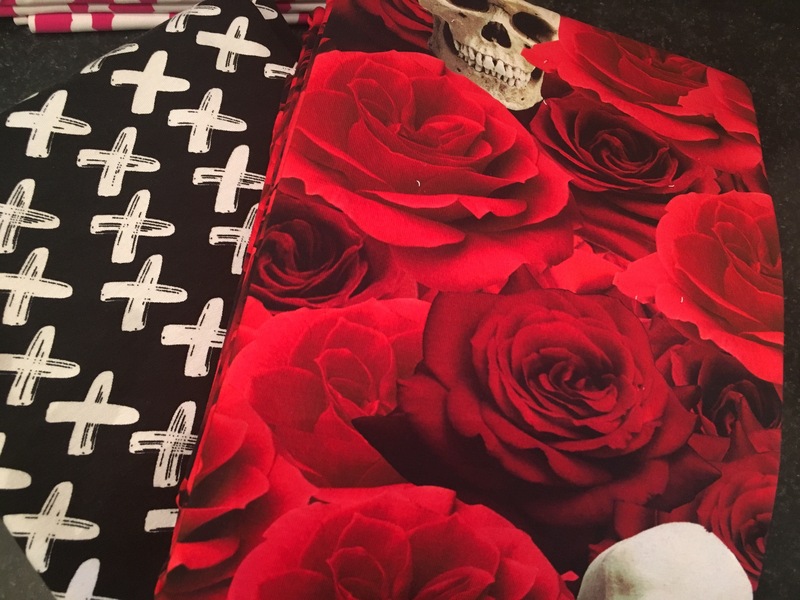 Now what to make… I think the red roses might turn into a Lady Skater. Decisions, decisions.